Luanda was founded by Portuguese explorer Paolo Dias de Novaes as St. Paul of Luanda in 1576. It became the capital of a Portuguese colony in 1586 and became the capital of independent Angola when the former Portuguese colony gained its independence in 1975. 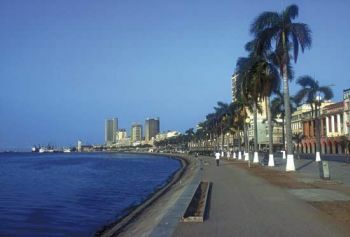 Luanda is also the largest city in Angola with an estimated 2009 population of over 4.5 million. The city is located in the northwestern region of the country on the coast of the Atlantic Ocean. The most common religions are Catholic, Baptist, and Methodist but missionaries of many faiths reside in Angola. The city’s major sports are basketball, soccer, and tennis. As major port city for Angola in the sixteenth century, Luanda became the center for commercial, political, and cultural affairs. The Portuguese also used Luanda as their major slave trading port until 1836. The end of slave trading caused a temporary decrease in Luanda’s economy and export activity but by the 1840s, the city exported palm and peanut oil, timber, ivory, cotton, coffee, tobacco, and cocoa. Throughout the late 19th and early 20th centuries Colonial Portuguese authorities invested in port and rail infrastructure to expand agricultural and mineral exports. By 1940, the city had 61,208 people including nearly 10,000 white inhabitants. After World War II new waves of colonists from overcrowded Portugal arrived. The growth of the "European Quarter" often meant the displacement of Africans to slums on the edge of the city. Despite the poor housing conditions, Luanda offered more employment and educational opportunities than in the rural areas and increasingly drew Africans from the interior. Many of these new residents in turn began to support independence movements and call for the end of Portuguese rule. Luanda became the center of nationalist activity. It also became the leading place in the colony to celebrate indigenous culture with events like the annual Carnival festival. Angolan independence came in 1975 when by that point the city had 475,000 people. Independence was immediately accompanied by civil war as the new government in Luanda was challenged by the National Union for the Total Independence of Angola (UNITA) in the countryside. The war caused thousands of residents to flee to Luanda which in turn stalled the economy. The Angolan civil war ended in 2002. Since that time the city’s growth and development has been uneven. While many impoverished residents are still coping in shantytowns and slums around Luanda, the city’s core has benefited from significant foreign investment. Downtown Luanda, which serves as the nation’s business center, enjoys a modern infrastructure as skyscrapers dominate the skyline. Yet a high unemployment rate has forced many Luanda residents to find supplementary income in small trade, and smuggling and other criminal activity. Nonetheless the University of Luanda and the Angolan International Airport are both located in the city, and Luanda continues to be a busy international port. Among the thirty busiest ports in the world, Luanda’s top exports are coffee, cotton, iron, salt, and diamonds. Karen Ellicott, Cities of the World, Vol. 1: Africa (Detroit: Gale, 2002); Eric Young, "Luanda, Angola" Encyclopedia of Africa, editors, Kwame Anthony Appiah and Henry Louis Gates, Jr.